The Hedge Mage is a natural spell caster, they glean divine and arcane magic from within and around them. Often called a beggar mage or a jackcaster by city folks, due to the limited scope of casting they can provide and the lack of formal training. More numerous than Clerics and Wizards, Hedge Mages can be found all across Tharstelding. Adventures: Like everything else, adventuring comes natural to a Hedge Mage. Due to their versatility they are often welcome additions to any party. It is very common to see these natural casters seeking the life of an adventurer. Characteristics: Hedge Mages can vary greatly as they are capable of many things, most will select spells to fill certain rolls. Spell selections to specialize in healing, fighting, artillery and buffs are all very common. All and all a Hedge Mage is naturally adept in most things, a trait in which they often reflect in character and confidence. Alignment: Alignments vary based on the individual’s spheres of influence rather than on class. A Hedge Mage from a civilized area might be inclined to be lawful, whereas a Hedge Mage born into a savage orc tribe may drift to chaos. This class imposes no restrictions on alignment, although the nature of their balance tends to lead the majority of Hedge Mages into neutrality. Religion: Although able to cast divine magic, a Hedge Mage does not have to be beholden to any god. They are not required to perform duties for any church, neither are they in jeopardy of losing their ability to cast divine spells based on actions that they take, or actions they choose not to take. That aside most Hedge Mages pay homage at the House of Five or the Temple of Dunes just like any other. Background: Hedge Mages are much like sorcerers. At some point in their life they unlock powers that they never knew they had. This event is known as a gleaning and usually manifests around adulthood as they explore the world around them and their personality begins to mature. Hedge Mages can come from any race in any nation, the power is also just as likely to be endowed to males as it is to females. At first they are clumsy, with little understanding of the power that they have unlocked. But as time progresses they learn to control their gleaning and practice its potential. With a little luck, an older Hedge Mage will discover the potential of a youth and take them under their wing. It is sometimes whispered that Hedge Mages are distantly related to various gods within the Shattered Pantheon. And that the spark of magic they maintain is all that remains of that faint bloodline. Races: All races have their own Hedge Mages. Within the most savage races, such as orcs, goblins and kobolds this ability is often seen as a mark of favor by the gods, and usually gets the individual placed in a higher station such as shaman, warlord or tribe speaker. Within civilized society the emergence of a new Hedge Mage can be seen as an ill omen or a shame on the bloodline of the family. In short, a Hedge Mage can come from any race, gender or society with no specific rhyme or pattern. 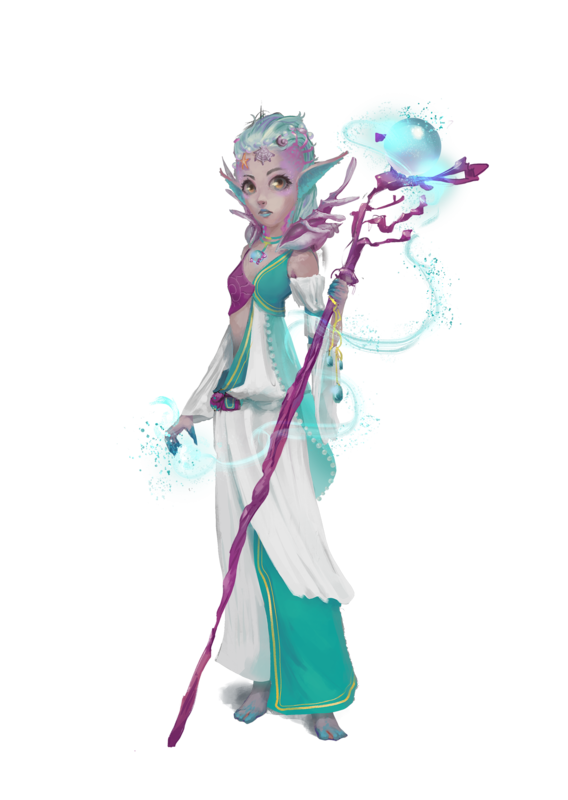 Other Classes: Being as talented as they are Hedge Mages find few that would not enjoy their company. Wizards and Clerics often feel a level of jealously in the lack of training that a Hedge Mage requires whereas Sorcerers and Bards may develop a special bond to a Hedge Mage. Most other standard classes view Hedge Mages as a welcome addition to the party. Role: A Hedge Mage has no specific role within a group. They do well at filling in the gaps. Depending on their build, they can act as a backup healer, a stand up warrior, an effective artillery unit or a covert spy. There is little that a focused Hedge Mage cannot do. Hedge Mages have the following game statistics. Abilities: As such a versatile caster the Hedge Mage benefits from several key ability scores. Charisma determines the number and highest level of spells a Hedge Mage can obtain. It also increases the effectiveness of a Hedge Mage’s spells. Those that decide to focus on a martial path may find physical abilities such as strength and constitution to be helpful whereas those that wish to focus on spell casting may find dexterity to be more beneficial. Skill Points Per Level: 4 + Int modifier. * Provided that the Hedge Mage has a high enough charisma score to have a bonus spell of this level. The Following is a list of class features for the Hedge Mage class. Weapon and Armor Proficiency: Hedge Mages are proficient with simple weapons. Hedge Mages are also proficient with light armor, light shields and bucklers. Through dedicated training with armor a Hedge Mage equipped with light armor and/or a light shield or buckler does not incur an arcane spell failure chance when casting arcane spells. A Hedge Mage is still required to have a hand free for any spell with somatic components. A multi-class Hedge Mage still incurs the normal arcane spell failure chance for arcane spells received from other classes. Spells: A Hedge Mage casts arcane and divine spells (the same type of spells available to clerics and sorcerers), which are drawn from the cleric and sorcerer spell list. They can cast any spell they know without preparing it ahead of time, the way a wizard or cleric must (see below). A Hedge Mage may select and cast divine spells opposed to their alignment unlike a cleric. To learn or cast a spell, a Hedge Mage must have a Charisma equal to at least 10 + the spell level. The difficulty class for a saving throw against a Hedge Mage’s spell is 10 + spell level + charisma modifier. Like other spell casters, a Hedge Mage can cast only a certain number of spells of each spell level per day. Their base daily spell allotment is given above. In addition, they receive bonus spells per day if they have a high charisma (see table 1-3 on page 17 of the Pathfinder Core Rulebook). When the Hedge Mage level table indicates that the Hedge Mage gains 0 spells per day of a given spell level (for instance, 1st level spells for a 2nd level Hedge Mage), they gain only the bonus spells they would be entitled to, based on their charisma score for that spell level. The Hedge Mage’s spell selection is extremely limited. A Hedge Mage begins play knowing four 0 level spells of their choice, two of which are selected from the sorcerer list and two from the cleric list. At most new Hedge Mage levels they gain one or more new spells as indicated above. Unlike spells per day, the number of spells known to a Hedge Mage is not affected by a high charisma score. Upon reaching 5th level in the Hedge Mage class, and at every third Hedge Mage level after that (8th, 11th and so on), a Hedge Mage can choose to learn a new spell in place of one that they already know. In effect, the Hedge Mage loses the old spell in exchange for the new one. The new spell’s level must be the same or lower as that of the spell being exchanged, it must appear on the same class spell list as the spell being replaced, and it must be at least two levels lower than the highest level of spells that the Hedge Mage can cast. A Hedge Mage may swap only a single spell at any given level, and must choose whether or not to swap the spell at the same time that they gain new spells known for the level. As noted above, a Hedge Mage need not prepare their spells in advance. They can cast any spell they know at any time, assuming they have not used up their daily allotment of spells for the day for the spell’s level. A Hedge Mage requires a divine focus as a cleric (although this need not be a holy symbol), and a spell component pouch as a sorcerer. Limited Ability: Although a Hedge Mage pulls spells from the Cleric, Druid, Bard and Wizard/Sorcerer list, they do not automatically gain the ability to use spell trigger or spell completion items from those lists. The Hedge Mage may use spell trigger and spell completion items if they know the spell, or if they have the same item creation feat. For example, a Hedge Mage that knows magic missile may use any spell trigger or spell completion item that duplicates the magic missile spell. Another example, a Hedge Mage that has the Craft Wand feat may use any wand that contains a spell from the Cleric, Druid, Bard or Wizard/Sorcerer list as normal, even if they do not know the spell. Any spell above 6th level is not considered to be on a Hedge Mage’s spell list. Focused Path: At 1st level a Hedge Mage must select one of three Focused Paths to pursue: Arcane, Divine or Combat. This choice affects the character’s class features as listed below but does not restrict their selection of feats or special abilities in any way. Arcane: At 1st level the Hedge Mage begins play with a familiar. The familiar advances as normal based on the Hedge Mage’s class level in place of wizard levels. At 5th level the Hedge Mage gains the ability to take 10 on any use magic device check, even if distracted or threatened. At 10th level the Hedge Mage’s Charisma is increased by 2. At 15th level the Hedge Mage may apply any single metamagic feat that they possess once per day to any spell that they cast, the addition of this metamagic effect does not increase the spell level. In addition, when applying metamagic feats to spells that you cast there is no longer an increase in casting time. At 20th level the Hedge Mage may select two energy types from the following list: Fire, Cold, Electricity, Acid, Sonic or Force. When casting a spell with one of the chosen energy types the Hedge Mage may add their Hedge Mage level to the damage dealt, to a maximum bonus of twice the damage dice rolled. For example if fire was a selected energy the Hedge Mage would add 20 additional points of damage when casting a fireball spell. The bonus damage from this ability is the same type as the energy being used. If the spell deals damage in both of the chosen energy types the bonus damage has a maximum of up to three times the damage dice rolled, and the bonus damage is comprised of both types of energy equally. Divine: At 1st level the Hedge Mage begins play with one domain. They gain the granted powers of the domain as though they were a cleric equal in levels to their Hedge Mage level. A Hedge Mage never gains access to the spells above 6th level in the selected domain. They do not gain a domain spell slot, they simply add the spells from the domain into their pool of divine spells known. At 5th level the Hedge Mage gains the turn undead feat, and may use this ability a number of times per day equal to 1 + their charisma modifier. Treat the Hedge Mage’s class level as their cleric level. This ability does not confer the ability to channel energy to the Hedge Mage. At 10th level the Hedge Mage‘s Charisma is increased by 2. At 15th level the Hedge Mage grows feathery wings gaining a flight speed of 60’ (40’ if it they wear medium or heavy armor or carry a medium or heavy load) with good maneuverability, becoming a magical creature. They are forevermore treated as an outsider (native) rather than a humanoid for the purposes of spells and magical effects. Additionally the Hedge Mage gains damage reduction 10/magic. At 20th level the Hedge Mage adds 1 additional divine spell known per spell level. In addition they gain 1 additional spell per day per spell level. Combat: At 1st level the Hedge Mage gains martial weapon proficiency in all martial weapons. In addition they may cast spells with somatic components when wielding a melee weapon as though their hand were free. They also gain proficiency with heavy shields, and the ability to ignore the arcane spell failure associated with heavy shields. At 5th level the Hedge Mage gains Weapon Focus as a bonus feat, in addition they gain medium armor proficiency and the ability to ignore arcane spell failure associated with medium armor. At 10th level the Hedge Mage gains Greater Weapon Focus as a bonus feat applied to any weapon they currently have Weapon Focus with, even if they do not otherwise qualify for this feat. If the character already has this feat they may select any other combat feat instead. In addition, the Hedge Mage may now treat their Hedge Mage class levels as though they were Fighter levels for future feat selections. At 15th level the Hedge Mage gains the ability to channel magic through melee attacks. The Hedge Mage may now channel any spell that they could normally cast, through a melee attack, as part of a standard action. This ability expends a daily use of the spell whether or not the attack is successful. The use of a spell in this manner does not provoke an attack of opportunity. Only spells with a casting time of 1 standard action or less can be used with this ability. Spells with an area/range other than touch used in this manner effect only the target of your attack. For example, a fireball spell would not create a 20’ radius area of effect centered on the target. Spell resistance applies as normal for the spell being channeled. If the spell is successfully resisted the weapon deals damage as normal. If material components are required they must be in your possession and are expended as normal. At 20th level the character gains heavy armor proficiency and the ability to ignore arcane spell failure associated with heavy armor. In addition the Hedge Mage gains damage reduction 5/adamantine. Identify (Sp): At 1st level a Hedge mage learns to identify the properties of magical items more accurately. The Hedge Mage can now cast Identify as a spell like ability a number of times per day equal to 1 + their charisma modifier. Magic Infused Weapons (Su): At 1st level the Hedge Mage acts as a conduit of magical energy. As long as they have a 1st level (or higher) spell available for casting any melee or ranged weapon they use deals an additional 1d6 points of raw magical damage. If the Hedge Mage has no available spells their weapons still deal a single point of raw magical damage. Furthermore any weapon they wield is considered magically aligned. Magic Infused Defense (Su): At 3rd level the Hedge Mage hones their conduit of magical energy. This confers itself as an armor bonus to armor class equal to the highest level spell available for casting. This effect is always active but can be lowered for 1 round with a standard action. This is a force effect similar to the Mage Armor spell and does not stack with other armor bonuses. Bonus Feat: At 6th level and every 6 levels thereafter a Hedge Mage may select a bonus feat depending on their Focused Path. If the Hedge Mage’s focused path is combat they may select any combat feat, assuming they meet the prerequisites for the selected feat. If the Hedge Mage selected Arcane or Divine as their focused path they may select any metamagic feat, item creation feat, spell focus or spell penetration as their bonus feat, assuming they meet the prerequisites for the selected feat. Rebuild Mind: At 4th, 9th, 14th and 19th level you may exchange any number of spells you know for spells of the same level. The exchanged spell and new spell must be from the same spell list. Magic Infused Skills (Su): The final tier of the Hedge Mage’s magical conduit, at 11th level the Hedge Mage adds a competence bonus to any skill that they have at least 1 rank in equal to the highest level spell that they have available for casting. Bard Spell: At 7th, 13th and again at 16th level, the Hedge Mage may select any spell from the Bard spell list of a level that they are capable of casting and add it to their list of arcane spells known. Druid Spell: At 8th, 14th and again at 17th level, the Hedge Mage may select any spell from the Druid spell list of a level they are capable of casting and add it to their list of divine spells known.